Eicher Trucks & Buses has conceptualized ‘Naya Samay Nayi Soch’ 360 degree brand initiative. Currently the B2B business is very transaction driven. However, in the past 70 years, there has been an evolution of the transport business in terms of customer needs. Eicher’s brand promise of Partnering Prosperity is all about going beyond transactions and being empathic and people-centric, to forge lifelong partnerships with customers & all stakeholders in the ecosystem. The intent is to question the norm and relook the traditional practices in a fast evolving business environment. 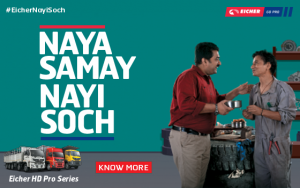 In keeping with the brand promise of ‘Partnering Prosperity’ and developing a strong connect with the next generation fleet owners and stakeholders, Eicher Trucks & Buses has conceptualized ‘Naya Samay Nayi Soch’ 360 degree brand initiative. It is a comprehensive and collaborative multi-stakeholder initiative to highlight select people and situations that are driven by ‘progressive thinking’ and emotionally connect with the power of their ‘nayi soch’. The belief is to tickle the psyche of the customer as they will empathise with this ‘human’ approach to business, forging long lasting relationships and making a deeper impression. This is not just restricted to communication but a new approach to life and work, to be internalized by the company and its employees. Also, the Company will undertake training of sales people with the arsenal of this ideology, which they can utilise to get the customer to connect with the philosophy. “Our new philosophy –“Naya Samay Nayi Soch” is aimed at building a strong emotional connect and strengthen Eicher’s image as a premium and modern brand in the commercial vehicle industry. We want to use this platform to showcase our new brand philosophy, and inspire all our stakeholders to embrace this progressive outlook. We would like to recognise all the partners and stakeholders who have taken the industry towards a forward looking path”.